U-10s play football against Naomh Eanna 2 on Wednesday evening in Gorey at 7 o’clock. They will hurl against Liam Mellows in Coolgreany on Fri evening at 7.30pm. U-14s beat Marshalstown at home last Thursday, and will play Craanford away next Thursday at 7.30pm. U-16s lost out to Gorey B last Friday evening, and Minors footballers had a hard-fought battle to come out winners by one point in Clonard last Wednesday evening. Good luck to all teams in their games this week. There will be a field day in Ballyroebuck on Sunday August 4th after the Kilrush Patron in conjunction with the Parish and Kilrush Hall Commitee – your support would be greatly appreciated. The under 10s have no game this week. Training on Sat morning at 10am – Hurling and football. U-14s won by 2 points last week v St. James in a 10 goal game. This Thursday, football against Marshalstown,at home at 7.30pm. Good luck to all with matches this week. Upcoming events….Midweek voices this Wednesday 8-9pm with Dan Walsh on South East radio is all about Askamore and its environs, and the clubs and groups in the area. Both the Senior Club and Coiste na nOg are featured on this program. There will be a field day in Kilrush on Sunday August 4th after the Kilrush Patron in conjunction with the Parish and Kilrush Hall Commitee, your support would be greatly appreciated. 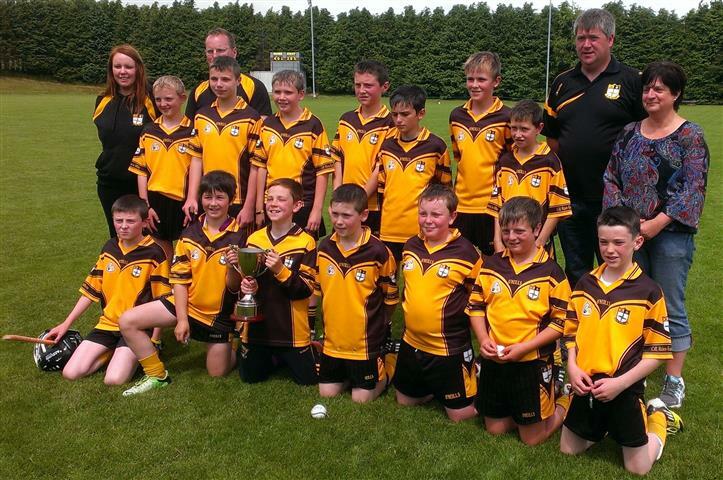 Well done to Askamore’s U-12s on their recent win in the Tom Kenny Hurling Tournament. Congratulations to all the teams who took part in the Tom Kenny U-12 Hurling Tournament. A great day was had in Ballyroebuck on Sunday 30th as Monageer, Askamore, Carnew and Bunclody battled it out for the Shield and Cup finals. Monageer came out winners of the Shield and Askamore were the winners of the Cup. Well done to all teams involved for their sportsmanship and great entertainment on the day. The U-12s also had success in Duffry Rovers on Saturday where they also won. U-16s lost out to Camolin on Monday last and the Minors also lost out to Monageer on Wednesday. U-16s play Burren Rangers on Tuesday night at home. U-10s are having a very successful season, playing Ferns and Liam Mellows. Training continues on Saturday mornings. U-14s had no match this week. Good luck to all teams in their matches this week.